The taekwon-do ITF event of special techniques has been described. A comparative analysis of two jump stiles of the technique timio nopi ap chagi has been introduced. Specific gravity in the final stages of the technique, for both classic and non scissors style has been calculated and shown on the prints. The analysis of scissors and non scissors jump style of the technique twimio nopi ap chagi has been conducted. The more effective jump stile has been indicated. The analysis has been conducted on a 16 years old competitor, 180 cm tall and 62kg. weight, he has been learning the classical jump method for 4 years. His maximum breaking altitude was 260cm. and has not increased in the time period of one year. During one practice, after changing the jump style, which he has been learning for 30 minutes he achieved the altitude of 270 cm. Key words: taekwon-do, taekwon-do special techniques, the evaluation of jump techniques. The dynamic evolution in taekwon-do sport competition is dated back to the mid 80's. The coaches as well as the competitors are constantly looking of new solutions which will allow them to achieve victory in the competition of patterns, sparing, power braking and special techniques. The competition of special techniques is a discipline with a very high degree of difficulty. The competition itself is based on retching the highest altitude or length with a given kick. In this competition a special type of machine is used, which allows the referees to adjust the altitude and the setting (vertical or horizontal) of the target board. When during the attempt the target board changes it's position by 45 degrees the competitor is awarded with one point, if the target board changes its position by 90 degrees, the competitor is awarded with two points. In this competition the competitor has the right to one test jump. For male competitors this competition consists of : Twimyo Nopi Apcha Busigi, Twimyo Nomo Yopcha Jirugi, Twimyo Dollyo Chagi, Twimyo Bandae Dollyo Chagi, Twiau Dollmio Yopcha Jirugi. In the case of female category the competition consists of: Twimyo Nopi Apcha Busigi, Twimyo Nomo Yopcha Jirugi, Twimyo Dollyo Chagi. In the team event there are three female and five male participants. These competitors must be the members of the team which participates in the other team events. Each of the competitors presents one chosen technique, other then the techniques presented by the rest of the team. The sum of points achieved by all competitors reveals the winner. 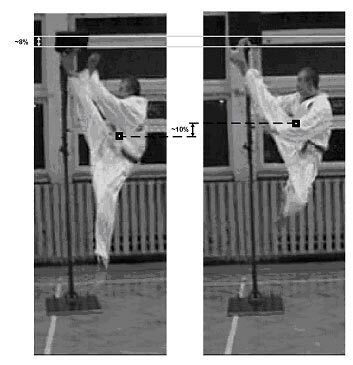 The purpose of this theses is to compare the two jump styles of the technique twimio nopi ap chagi. The analysis has been conducted on a 16 years old competitor, 180 cm tall and 62kg. weight, he has been learning the classical jump method for 4 years. His maximum breaking altitude was 260cm. and has not increased in the time period of one year. During one practice, after changing the jump style, which he has been learning for 30 minutes he achieved the altitude of 270cm. The attempts have been recorded with a digital camcorder in the Digital18 format. Based on that material, the specific gravity has been calculated for each of the jump styles. In edition, a very precise analysis of each stage and phase of the technique has been conducted. The results of the research are presented on the prints 1, 2, 3. Print 1 presents the calculated general specific gravity for each jump style. It can be observed that the person in the print 1A has lowered general specific gravity, compared to the person in the print 1B, which has an automatic increase of over 8% on the range of the leg. In edition it is noticeable that the general specific gravity in the print 1A is moved slightly to the back which can cause problems with the balance during the landing. The difference in the general specific gravity for the scissors jump style A and non scissors jump style. The analysis of scissors and non scissors jump style of the technique twimio nopi ap chagi. Print 2 shows step by step every faze of the technique twimio nopi ap chagi scissors jump style A and non seizer jump style B. 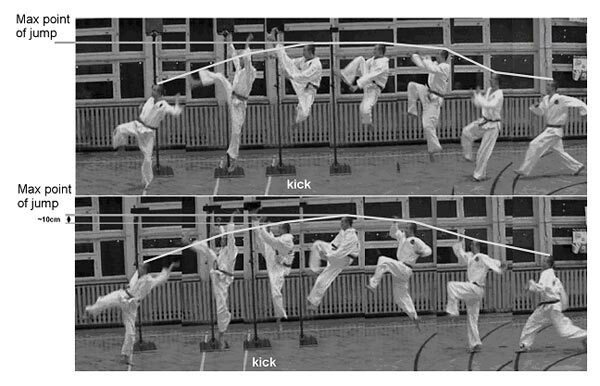 In the second case, one can notice that the competitor reaches the maximum point during the kick and the other leg is bend in a natural way. In the first case the competitor reaches the maximum point of the jump before kicking and the leg starts to kick in the moment of falling, in this case the competitor looses about 8 cm. The approach angel in the Print 3A, equals about 65 degrees and is the cause for which the competitor has a much longer distance to jump, in order to rich the target. In the print 3B the approach angel equals about 71 degrees, which is much better from the throw theory point of view. 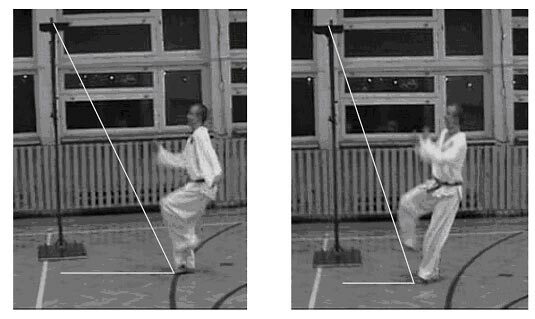 The analysis of the approach angel of scissors and non scissors jump style of the technique twimio nopi ap chagi. Based on the conducted analysis it can be uttered that the competitor who uses the scissors jump style doesn't kick in the highest point of the jump which causes a 10% decrease in the technique altitude. These kind of losses do not exist in the case of non scissors jump style. The competitor naturally lifts the specific gravity of his body by a few percent and thereby increases the range of the non scissors technique. In edition the scissors jump style has a much lower approach angel, which increases the distance that the competitor has to jump in order to reach the target. The non scissors jump style gives the competitor a higher range of reach then the scissors jump style. In the case of non scissors jump style one must pay attention to the positioning of both legs which causes the rise of specific gravity.